This electro-tape is 10mm wide, highly visible, UV protected and excellent for fencing horses. It also offers better conductivity that the standard (Supercharge) electrified fencing tape. Hotline TC49 Electro-tape has 4 galvanised steel conductors and is available in 100m lengths of white electro-tape. 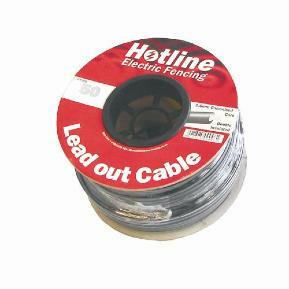 Hotlines HT/G - Insulated lead out cable with a 1.6mm galvanised steel core to carry power from the mains unit to the fence line and any other electric fence connections. Insulated to 18,000 Volts. Ideal for use under gateways when passed through conduit/plastic piping. Never use ordinary house cable for electric fencing applications as it is only rated at 600 volts and may cause leakage to earth. 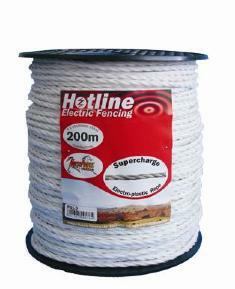 P21 Supercharge 6 Strand Electro-Plastic Fencing Wire is Hotline's mid-strength polywire, suitable for fence runs of up to 750m. The polywire is strong and conductive, containing six stainless steel conductors. Recommended for use with cattle. This electro-tape is 20mm wide, highly visible, UV protected and excellent for fencing horses. 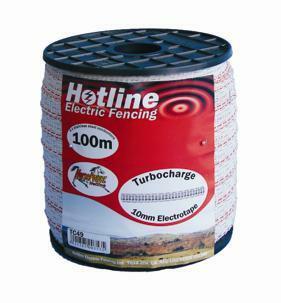 It also offers better conductivity that the standard (Supercharge) electrified fencing tape. Hotline TC43 Electro-tape has 6 galvanised steel conductors and is available in 200m lengths of white electro-tape. 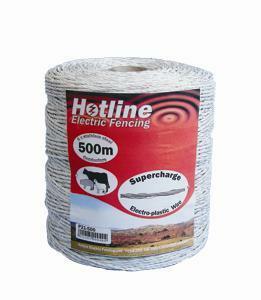 This electrified rope has a 6mm diameter, it is strong and highly visible, making it perfect for horse fencing and in particular paddock boundary fencing and protecting post and rail fencing. 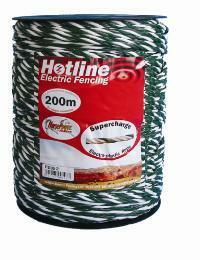 Rope is also an excellent material for general and heavy duty electric fencing applications. For those of you who are interested, P51 Supercharge electrified rope is manufactured from HDPE (High Density Poly-Ethylene) and this means that it has full UV protection.